At the request of the Holy Father, the Apostolic Nuncio to Great Britain, His Excellency Monsignor Antonio Mennini, is being transferred from his current responsibilities to serve directly in the Secretariat of State of the Holy See, assisting in its work in relation to States. 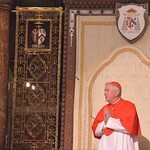 In this capacity, Archbishop Mennini will serve the Holy Father with particular reference to the State of Italy. In these matters Archbishop Mennini has unique experience and knowledge which is much appreciated by the Holy See. On behalf of the Bishops’ Conference of England and Wales, and in the name of the entire Catholic community, I express our warmest thanks to His Excellency for the service he has given to the Church in our countries. He has been most attentive and sensitive to our needs and situation, while always representing the Holy Father with precision and clarity and sharing insights into the needs of the Universal Church. His presence amongst us bishops has always been that of a brother and we have never failed to appreciate his kindness and hospitality. We now wish him well in his new appointment to which he will bring insight and wisdom. We assure him of our prayers for this mission and for his own health and well-being.